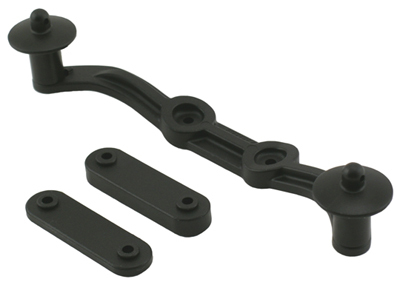 RPM Slash 4x4 Adjustable Height Body Mounts, Black Discounts Apply ! RPM73932 - RPM Slash 4x4 Adjustable Height Body Mounts, Black. RPM Adjustable Height Body Mounts for the Traxxas Slash 4x4 are designed to give you optional body height positions where stock left you none. Our version of the Slash 4x4 body mount starts off lower than stock by 1/8� (or approx. 3.2mm). We supply a pair of molded spacers to allow you the option of a stock height body position using the thin spacer under the body mount. If monster suspension travel is needed or you just like the higher stance and larger wheel well openings a taller body mount provides, you can increase the height by 1/8� using the thicker of the two spacers. In extreme cases, both spacers may be used for a full 1/4�* (6.35mm) of extra body height. What's Included: Each kit contains two body posts, one body mount bracket, two spacers and two M3 x 16mm mounting screws. Two kits will be needed to complete one vehicle. Tech Notes: RPM Body Mounts can be mounted in either the front or rear location on the Traxxas Slash 4x4. They can only be used on the rear position on the Stampede 4x4. *Using both RPM spacers requires longer screws (M3 x 20mm) � not included.